A Tropical Breeze suffered minor damage during Hurricane Michael which is providing the opportunity to make some updates. When completed by May 24th, A Tropical Breeze will have a new light blue exterior with white trim. The interior will have all fresh paint and new flooring. The kitchen will have new white kitchen cabinets, new granite counter tops, sink, dishwasher and more. The master bath will have new bathroom cabinets, granite countertop and sinks. As always, A Tropical Breeze has an Elevator, Free Wi-Fi, well-equipped kitchen and Free long distance calling. TROPICAL BREEZE is a luxury beachfront home with an incredible view of beautiful, white sand beaches and natural sand dunes, where dolphins can be seen close to shore almost daily. Tropical Breeze is located 1/4 mile from St. Joseph Peninsula State Park. A great deal of love and attention to detail has gone into making this your perfect home away from home. The house is furnished with the feel of the West Indies, dark wood furniture, a fireplace and soft oversize sofas with accents of palm trees and seashells, all in a light and airy atmosphere. The kitchen is full size, with a new stainless steel oven/stove. We provide a complete selection of appliances, pots, pans, cooking utensils, and Mikasa seashell dishes. No mismatched anything in this kitchen. Everything is in place to make it a pleasure to cook in this fully equipped kitchen. Features: 60" LTE flat screen TV in living area and 46" flat screen TV in large master, smaller flat screens in the other 2 bedrooms. Wi-Fi, free long-distance plus the 8.5-mile bike path. 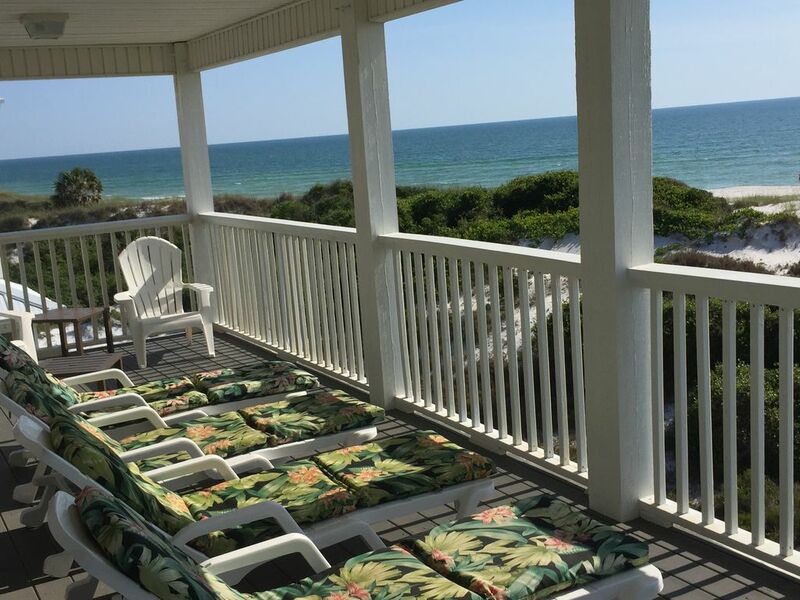 The beach side of Tropical Breeze features a lower screen porch, furnished in white wicker that includes rocking chairs, wicker chairs and a breakfast/game table. There is also a large upper porch with 4 chaise lounges. A view of the sunset and beach can be enjoyed from either level. Each of the 4 bedrooms has it's own bathroom, tv and it's own name. The master suite is 'White Sands' and features a 4 poster, king size bed, executive desk, 46' Flat screen TV, WI-FI, Gulf view, deck and an oversized bath with his and her vanities, large glass shower and Jacuzzi tub. The second master is 'Kings Crown', includes a king size Victorian bed, 32' led flat screen TV and a gulf view. 'Palm Paradise' is located on the main floor, with a queen size, sleigh bed, a large Jacuzzi tub and a view of the sunrise. 'Under the Sea' is decorated with a tropical fish theme and has 2 sets of bunk beds, full on the bottom and twin on the top. Also for the kids or kids at heart, we have our 'Beach Club' on the large patio under the house, which includes a seating area, picnic table, gas grill and an outdoor enclosed hot water shower. This house offers a large selection of areas to sneak away for an hour or two. If you are in need of additional space for a larger group, it may be possible to rent one or both of the 4 bedroom homes next to Tropical Breeze. The three homes combined could accommodate 35 people. Tropical Breeze is a NON SMOKING property and does NOT allow pets. Tropical Breeze is owned by 2 families from Atlanta, the Newmans and the Pridemores (pictured). Our children went to elementary school together and when we found this great house we formed a partnership. Our kids are much older now and both families have enjoyed many happy days at A Tropical Breeze. The Pridemores heard that Cape San Blas was named the #1 beach in the USA, including Hawaii, in 2002. A trip was immediately scheduled to see the area. A Tropical Breeze was way out of our price range, but we loved it so much we videotaped it and went back to talk to friends and neighbors about a partnership. Fortunately, the Newmans were in the market for investment property and our partnership was formed. The home was first seen on July 3rd, 2002 and we were owners by August 24, 2002. Every time we visit, we fall in love with the house and area all over again. We are also fortunate to have many happy repeat guests. There are so many, but some of our favorites are the great fishing on the beach and in the bay, the peacefulness and lack of crowds, the sunsets over the Gulf right in front of the house, incredible fishing and scalloping, Coneheads ice cream store, bonfires on the beach, dolphins and seashells. toilet, Pretty powder room on main floor near kitchen and elevator. 4. full bathrooms, one in each of the four bedrooms. Jacuzzi tubs in two of the bathrooms. 1/2 bath Powder room on the main floor, Outdoor shower with hot water on patio area under the house. Downtown Port St. Joe is one block off of rt 98 with cute shops and wonderful restaurants. We love Joe Mama's pizza, Provisions, and Pepper. On 98 you will find Sunset Coastal Grill and Piggly Wiggly. The decks face the Gulf and the sun sets right in front of the house. The sunsets can be viewed from either deck or from the seating area on the boardwalk. Free long distance calling from the landline, answering machine also provided. Cell signal is unreliable on the Cape however you can set your smartphone to Wi-Fi calling and your phone will work. All beds are premade except for the sleeper sofa. The sleeper sofa sheets are in a bag with the towels. Pillows and a comforter are stored in the main floor bedroom closet. We have parking space for up to 6 cars and a boat. 2 cars across and three deep with boat on the side. 14 sets of bathtowels, hand towels and wash cloths are provided. There are two kitchen towels and a new sponge provided but I suggest bringing more kitchen towels. Bring your own beach towels! Table seats 10 with 8 dining chairs and 2 folding chairs located in the laundry room, plus 5 stools at counter adjacent to the table. There is also a table for 4-5 on the screen porch. All bedrooms and living room have flat screen TV's. The living room TV is a Smart TV and can access Netflix. Small stereo with speakers is located in the living area. It does have an aux cord outlet to plug in your personal music. A large selection of books are located in the living room cabinet next to the love seat. Take a book leave a better book is our friendly policy. A selection of beach toys is on hand in the grond floor closet along with folding beach chairs. Small grass area plus oleanders but the house is mostly surrounded by sand. The upper deck has 4 loungers, 4 adirondack chairs, 2 end tables Lower deck is a screened porch with table for 4, seating area with 2 chairs, 3 rocking chairs., 2 end tables. Cushions are provided. Patio area under the house includes the gas grill, seating area, picnic table, Adirondack chairs and a wooden bench. St. Joseph Country Club Public course is about 13 miles away. The BASICS, Queen-size sleeper sofa, linens, towels, refrigerator with ice maker, electric stove, oven, toaster, coffee maker, mixer, lots of counter space, alarm clocks, laundry room with washer, dryer, ironing board, iron, 5 TV's, all with cable, 2 DVD players, music station, Free Wi-Fi high speed internet access, telephone with answering machine, Free long distance calling, ceiling fans throughout, -------------------- The EXTRAS, screen porch, Mikasa seashell dishes, dining table large enough to seat 10 plus 5 adjacent kitchen bar stools, outdoor ping pong table, board games, books, executive desk for the guests who needs to get away but still stay in touch, beach chairs, enclosed outdoor hot water shower, 2 Jacuzzi bathtubs, boardwalk to beach, sunset view over the Gulf, sunrise view over the woodlands. I've been going to Cape San Blas for nearly 20 years, and A Tropical Breeze is by far the most well-appointed and comfortable home I've rented. The furnishings are lovely as well as comfortable. I can't speak for all the beds, but the king bed in the White Sands suite was amazingly comfortable. The location on the cape is one of my favorites, and Roni, is the best homeowner I've ever dealth with on any of the rental sites. She is friendly and her response time is astonishingly fast. I highly recommend A Tropical Breeze. Well we just returned from our week at ATB (A Tropical Breeze). Wanted to thank you for the use of such a wonderful house. My inlaws had their 50th anniversary and loved the place. They both love the area now too. I think my Mother In Law wants to pencil in for next year. We loved the house and everything you had in it. It was the best stocked house we ever had. My wife and her brother prepared a Thanksgiving meal one night as a surprise. My mother in law never gets to have Thanksgiving with all her kids so my wife planned that. Even her brother from California flew into Tallahassee for the week. We picked up a turkey in Port St. Joe at the Piggly Wiggly and they couldn't get over all the stuff you had in the house. We found a roaster for the turkey, the crockpot came in handy for the gravy. Had a mixer for mashed potatoes too. We went deep sea fishing with a boat in Port St. Joe and caught a ton of red snapper, it was the best fishing trip my father in law had. He is ready to come back next year to fish again. My other brother in law enjoyed fishing off the beach by the house every day. We all rode the bikes to the park and all over. Kids jumped on the bikes and grabbed some ice cream at Cone Heads a few times. Our kids had a good time in the bunk room. They enjoyed seeing all the dogs on the beach. Weather was great all week. Had some rough surf the first couple of days but the kids loved it with the boogie boards. Things calmed down as the week went on. Everything was beautiful. The house was great! Had everything u would need! Beautiful property, beach front, like home! Gorgeous property. Wonderful area for family and friends. Not commercialized beach. The area was safe for our 7 year old and comfortable for our 60 year old. The kitchen that had everything needed. We are cooks and the fact that the home was so well supplied was comfort to us. Beds were comfy and the bedrooms were private for mixed families. Very well executed house design and so clean!!!! We will be back... sooner than later hopefully! WOW! What an amazing vacation we enjoyed at 'A Tropical Breeze' on the north end of lovely Cape San Blas, just a 1/2 mile from the State Park. The weather was picture perfect - the mornings were cool and the afternoons warm. NO RAIN! The nights were ideal for star gazing. We made bonfires on the beach, cooked marshmallows and ate SMores. Then we marveled at the Milky Way, Seven Sisters, and Orion, and millions upon millions of stars. Fabulous! We cooked and cooked, and ate and ATE! The kitchen is spacious and very well organized, fully stocked with cookware and utensils for preparing large meals for family and friends. The screened-in porch is inviting. The beach views are spectacular - windows are everywhere in the home. Our master bedroom was relaxing -I slept in late every day. And the sunsets are simply stunning - reds, pinks, orange, yellow - crazy beautiful and awe-inspiring. Our guys are fisherman and went out almost daily. We ate fresh Red Fish Tacos and took a boat out in the Gulf to the Cape San Blas pointe. The undisturbed beach was ideal for shell collecting and beach walking. To top off our week, we went to the Blast on the Bay Songwriter Festival and enjoyed incredible music from talented songwriters. Coneheads serves good food and ice cream - I had a Root Beer Float and a Shrimp PoBoy. Yum. And their fries are double fried! The Trading Post has souvenirs, supplies and great pizza - perfect for our football watching Saturdays - and our teams won!! All in all - a perfect vacation. We highly recommend 'A Tropical Breeze'! Cant beat Cape San Blas! Great house! Travel insurance is available for 6.95% of the grand total. All payments are processed by VRBO. However, a rental contract will be emailed to you by our management company, Pristine Properties after a reservation has been made.